155 x 235 mm, 3888 grams 245 pages, XI, 245 p.
This book addresses the intersection of various domains of international law (refugee law, human rights law including child rights international law and humanitarian law) in terms of the implications for State obligations to child refugee asylum seekers in particular; both as collectives and as individual persons. How these State obligations have been interpreted and translated into practice in different jurisdictions is explored through selected problematic significant cases. 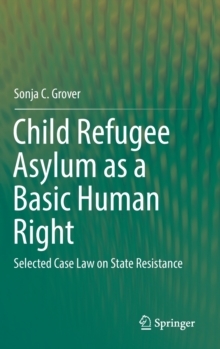 Further, various threats to refugee children realizing their asylum rights, including refoulement of these children through State extraterritorial and pushback migration control strategies, are highlighted through selected case law. The argument is made that child refugee asylum seekers must not be considered, in theory or in practice, beyond the protection of the law if the international rule of law grounded on respect for human dignity and human rights is in fact to prevail.